Ross G. R. Caldwell wrote: ...- one, the "collapse of time and space" aspect, shown by the term "Thou Bohu" (="tohuwabohu", from Genesis 1:2 וְהָאָ֗רֶץ הָיְתָ֥ה תֹ֙הוּ֙ וָבֹ֔הוּ וְחֹ֖שֶׁךְ עַל־פְּנֵ֣י תְהֹ֑ום וְר֣וּחַ אֱלֹהִ֔ים מְרַחֶ֖פֶת עַל־פְּנֵ֥י הַמָּֽיִם׃ ): the end of the universe is identified with its beginning. Later, following Jewish/Aristotle thinking, they were differentiated as matter and form. Through Isiah it was connected with building (the line of tohu, the stones of bohu - as in a plumbline used in construction - however, a line of tohu and stones of bohu implied destruction rather construction, so two ideas construction/destruction are derived from the verse : also one might associate it with 'the end is in its beginning' as per the Sefer Yetzirah - but this is via jewish exegesis rather than christian). As well as waste, void, chaos it can also be used depending on context to mean 'without worth', 'vain'. It's not a translation of the passage (which should be clear, people are familiar enough with the passage), it's a comment on the cosmograph in the book. At the end of the universe is the "Tohu Bohu", which returns to - literally recalls - the formless state of the beginning. It's not a translation of the passage (which should be clear, people are familiar enough with the passage), it's a comment on the cosmograph in the book. At the end of the universe is the "Tohu Bohu", which returns to the formless state of the beginning. According to some it is not a fifth element but rather an appelation for water, which was considered the primal element, here differentiating between the water above (tohu/bohu) and water below (aqua). e qui la tramontana aviva il gielo. di dio viva vive e sempre visse. Thank you Ross, a great illustration! The text on the left, between the two images, lists what I understand to be the diameters of the orbits of the planets according to "Alfragano" (Ahmad ibn Muhammad ibn Kathīr al-Farghānī). I think it likely that those illustrations derive from some more technical text than Il Dittamondo. Alfraganus, for instance, is also quoted a few times in Sacrobosco's De Sphera which (if I understand correctly) was also know as "De Sphaera Materialis" (as the illustration at the top of the page). marco wrote: By the way, you have not answered my question: when you say that "all of the earliest Italian explanations for this card call it SAGITTA" (or saetta?) which sources are you referring to? Mea culpa on my stating sagitta for saetta on the two c. 1560 treatises that Ross translated [edit, actually Fuoco and Cielo; finally dug up my copy of Ross's translation]. However the Steele sermon (I’ve seen no scholarly date besides Decker’s “ c. 1500”) which you already pointed out does show sagitta (because of course it was written in Latin) is Italian in the sense that it is likely written in Ferrara….by an Italian. The earliest attested name for “the Tower” is the Latin sagitta; but the Iater Italian names mean the exact same thing. More to the point is the use of sagitta in connection with God’s wrath by Filelfo – who at all events is the humanist closest to the Sforza court when the PMB was produced and whom I posit as behind the program of the PMB (which contains the earliest example of “the Tower). In the Ode dedicated to Bianca Sforza, in which a request for money is made (and which I connect to his ultimately being commissioned for the PMB tarot program), the plague in Milan where Filelfo is stranded is likened to God/Jupiter who “lights up the sky with with arrows [sagittis] that felled the savage Giants who dared to scale lofty mountains to shinng Olympus” (Ode IV.9-11. Robin 2009: 221); Fiellfo goes on to note the cause of the plague: “O greatest Jupiter [maxime Iupiter], would suddenly kill us all with celestial lighnting [fulminis]. The ungrateful plebs are punished because they failed to honor the deserving shade of the sublime and celebrated Duke Filippo with funeral rites. But should Filefo suffer for the sins of the Milanese….It is yours to ward off evil so that the poet may avoid death by fiery lightning. Let him depart from the city since lightning does not know how to check its wandering missles” (Ode IV.1.29-41, Robin, 223). Fielfo even dedicates an entire Ode, II.2, “To Jupiter: An invective against false liberty” in which he calls on the god to strike down the working class leaders of the Ambrosian Republic with bolts of lightning (lines 26-30, p. 103). In Filelfo’s Sforziad, written after the PMB appears but using the exact same metaphors found in the Odes, he describes Sforza’s siege of Piacenza where his weapons of arrows and cannonball are specifically likened to lightning (fulminate pilulae) (Book 3, line 82, tr. Robin in her Fiellfo in Milan, 1991: 69); later on his siege weapons again “resembled lightning and left a trail of smoke under the massive mound” (369f, p. 74) – just like the crumbling tower in “The Tower” cards struck by lightning; finally the chorus of women trapped in Piacenza lament “…when savage Hamiclar lay siege to the city, and when the leader of the Insubrians [Milanese]– may the gods destroy that cruel folk with their lighning bolts! – turned everything into spoils, burning our houses as he went.” ( 699f, p 81). Here we have the perfect literary cognates for “the tower” card in which God’s wrath is lighting – his tool of wrath described both as arrows (sagittis) and lightning; even the destruction of Piacenza – like a modern-day Sodom or Babylon – is reduced to rubble by the lightning employed by Jupiter’s earthly viceroy, Sforza. Sforza is of course the commissioner of the PMB and Fielfo allows for the use of Jupiters tools for the conceits of condottieri who could cast themselves as carrying out God’s providential “justice”, as meted out through them. The 15th century tarot decks after all weren’t made for monks but for condottieri – the former merely attempted to interpret them, usually negatively (but in the case of the arrow, they were essentially correct). So we have Filelfo using arrow/lightning as God’s wrath, in Milan dujring the siege, after which he is Sforza’s most valued humanist, when the PMB was created. 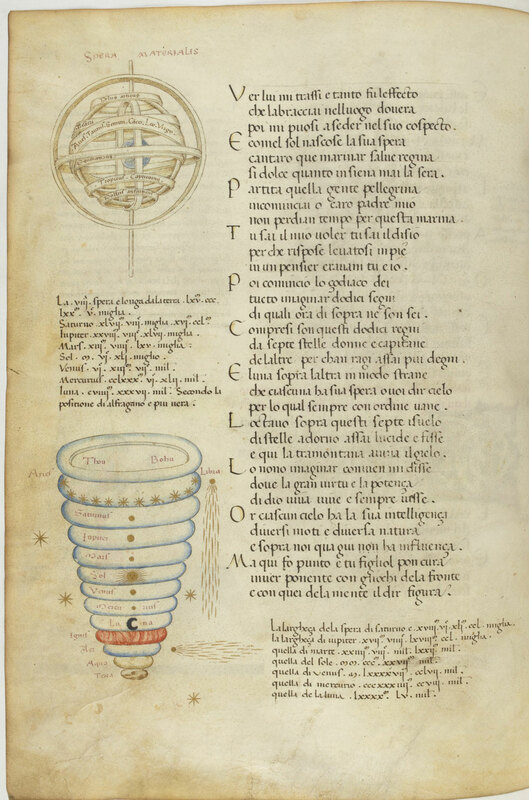 I still don’t see a single item in c. 1450 Milan pointing to lightning/star/moon/sun, other than Filelfo providing the rationale as to why those last two heavenly bodies would be placed near the top: he used them as metaphors for Sforza and Bianca (a classicizing touch he could have stolen from Plutarch who notes that Antony and Cleopatra named their children for the sun and moon in his Life of Anthony, 36). It doesn't matter how florid the decorations of the subject, the subject is still simply one thing - lightning. Focusing on incidental iconography leads you to begin telling a story you can't finish, since the rest of the sequence doesn't work with it. You are picking and choosing what is decoration/alterable/incidental, based on nothing that is intrinsic/internal to the card itself. Only your intepretation of the subset sequence allows for that arbitrary filter, nothing in the card itself. The undeniable facts are that there is both lightning and a tower in every 15th century “tower” card. In fact the two objects consistently interact – there is striking (and destruction - not mere "illumination"). This card is called sagitta/saetta because an arrow strikes an object. See my reply to Marco above in regard to contemporary use of arrow-as-lightning as-God’s-wrath to the PMB...written in Milan in the very year many posit the creation of the PMB in 1451. Your ahistorical lightning/star/moon/sun is a 21st century concoction without a 15th century parallel. Phaeded wrote: Your ahistorical lightning/star/moon/sun is a 21st century concoction without a 15th century parallel. I'm afraid that "lightning/star/moon/sun" is the Tarot designer's (15th century) concoction, not mine. I'm just trying to understand it. Sun, Moon and Star(s) is the convention. The sequence-designer added a thunderbolt to that list. I have never even bothered to look for any external evidence of a "convention" or even an explicit iconographic or literary parallel anywhere to it. There are other unique, unparalleled, things in the sequence, too. It is sui generis. As far as the logic of explaining it as "lights" goes, that is based in nature, so natural you can even take a picture of it. Forget the books on this one, the explanation is still right outside. Sun, Moon and Star(s) is the convention. The sequence-designer added a thunderbolt to that list. Actually the deck designer added a thunderbolt striking a tower to the deck. I suppose if you look out the window you can see something else. Actually the deck designer added a thunderbolt striking a tower to the deck. I don't think we can say with the same degree of confidence that the designer had the lightning striking a tower, as we can say that he had lightning (unless you happen to have the Ur-Tarot or the designer's notes on hand?). The thunderbolt is the essential, irreducible subject. I do indeed happen to think that the designer asked the artist to make it hitting a tower, because Tarot was invented in an urban environment and that was what came to his mind, but I think a tree would have had his imprimatur as well. Something that made it clear, in the small space of a playing card, that it was lightning, is what he was after. He probably would have liked Mitelli, too. But the Sicilian version - tower with no lightning - would have left him scratching his head. Completely misses the point.